Jo Shaw Taylor : Certified Blues Strat-o-Sister! I'm tellin' ya-- they are out there!! Meet Strat-o-Sister Joanne Shaw Taylor, from Birmingham, UK! Plays guitar like she's from Birmingham, Alabama instead! Discovered at age 16 by Dave Stewart of the Eurythmics, Stewart immediately recruited her into his band, D.U.P., along with sax babe Candy Dulpher (Prince alumni). Jo has shared the stage with legends BB King and R.L. Burnside, and has recorded with original Rolling Stones bassist Bill Wyman. Impressed yet? Wait till you hear Jo Shaw Taylor play! One writer calls her "...the love child of Dusty Springfield and Stevie Ray Vaughan...". Oh yeah! This girl sings too! 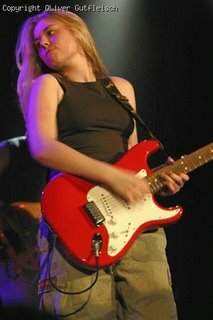 If Joss Stone played guitar, maybe Jo would have some competition. 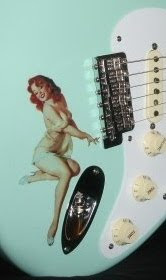 Jo actually let me know that she favors her Tele over that red Strat because of her "tiny hands". However, those same tiny hands can produce that big, crazy Albert Collins stranglehold vibrato. You know that vibrato I'm talkin' about! Now I know what some of you are thinking, "He's always goin on about these girl guitar players...". I'm just tired of the Britney Spears- Paris Hilton formula world, that's all. I say, let the Strat-o-Sisters out!! Because they exist people, and the biz ain't payin' attention-- not my problem! So, support your local Strat-o-Sister! And check out Jo Shaw Taylor at www.myspace.com/joanneshawtaylor and www.joanneshawtaylor.co.uk . Once again, the universe gives back without stereotype. Deal with it!